One of the novels I am most looking forward to next year is the release of Chadwick's Lady of the English. The UK cover was recently revealed and I love it! There is currently no date for the US release, but I will bring it to you as soon as I know! 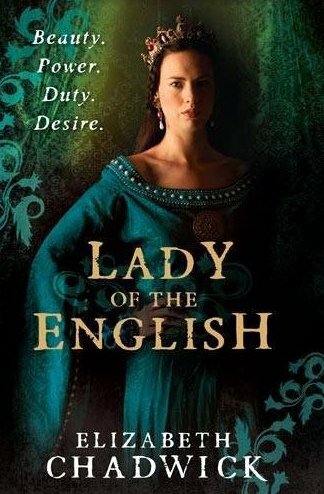 SYNOPSIS: Two very different women are linked by destiny and the struggle for the English crown. Matilda, daughter of Henry I, is determined to win back her crown from Stephen, the usurper king. Adeliza, Henry's widowed queen and Matilda's stepmother, is now married to William D'Albini, a warrior of the opposition. Both women are strong and prepared to stand firm for what they know is right. But in a world where a man's word is law, how can Adeliza obey her husband while supporting Matilda, the rightful queen? And for Matilda pride comes before a fall ...What price for a crown? What does it cost to be 'Lady of the English'? The lady is very striking! Great cover. Elizabeth Chadwick is definitely one of my favourite writers. I'm looking forward to reading this one. Sounds good! And I really like the cover. This should be another excellent book by Elizabeth Chadwick. Like the cover.